The walled garden has been awarded the prestigious GREEN FLAG AWARD 2018/19, achieving the maximum possible score for the second year running. 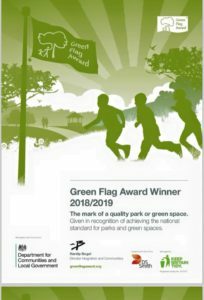 This is a mark of a quality park or green space and is given in recognition of achieving the national standard for parks and green spaces. The Mayor of Warrington, Councillor Karen Mundry, and some of the regular garden volunteers are pictured hoisting the flag in the kitchen garden.